Biomass energy is harvested from organic material made from plants and animals that contains stored energy from the sun. Such materials include wood, crops, manure, and other organic waste. Biomass is a renewable source of energy that has a much lighter environmental impact than traditional fossil fuels. As a part of the carbon cycle, harvesting energy from biomass produces only 10% of the carbon dioxide emissions than does burning fossil fuels. Putting biomass to use as a source of energy also reduces the amount of organic waste that ends up in landfills. The direct combustion of solid biomass is probably the oldest household technology and will continue to be the main energy source for cooking, water heating and domestic heating in many developing countries for years to come. A wide range of stove types that use solid biomass as fuel can be found around the world. However, very low quality combustion is an almost universal characteristic of the most traditional and widespread stoves. 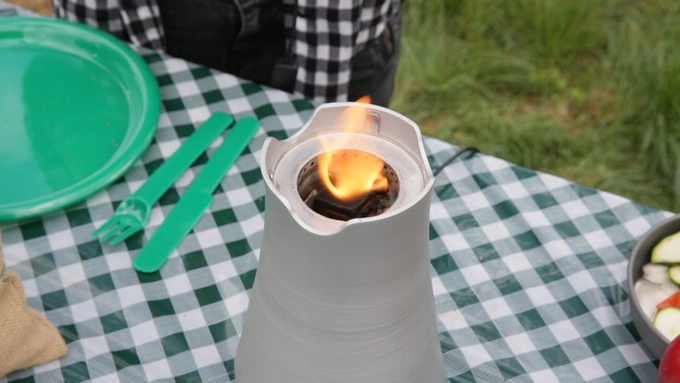 Enki Stove Wild is a revolutionary camp stove which can let you cook and grill as a pro using everything you can find in nature. 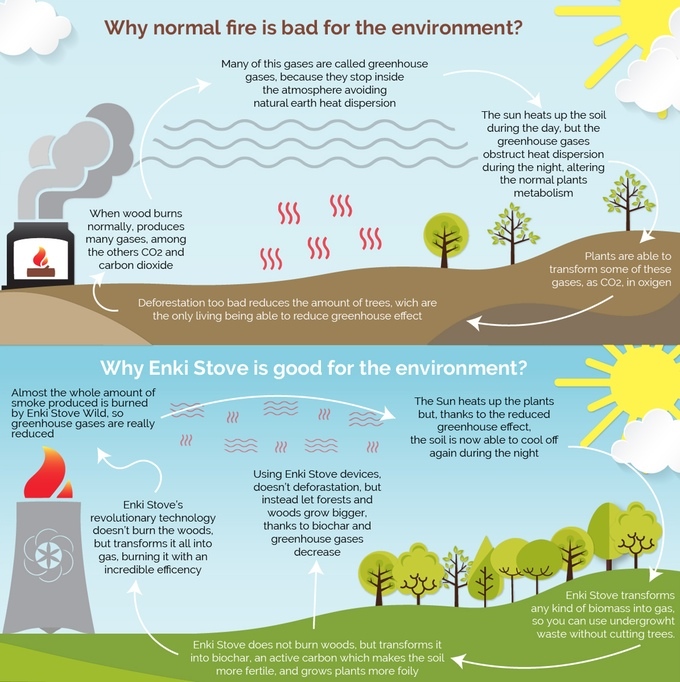 Enki Stove Technology transforms any biomass (pellets, wood, dry organic waste) in a powerful flame, up to 1000 °C degrees and 98% of combustion efficiency. 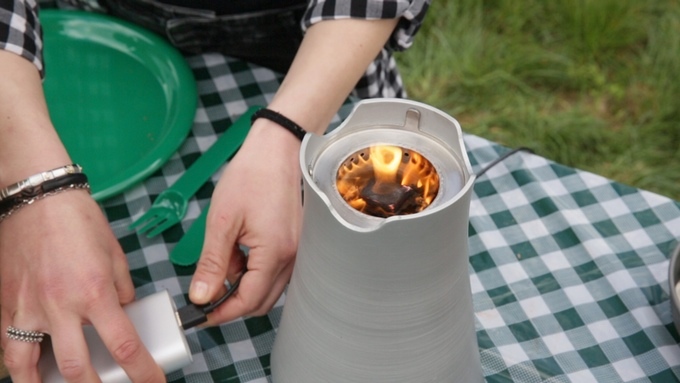 Enki Stove Wild is a camp stove, designed to run with every kind of biomass, avoiding the transportation of gas tanks or charcoal, everywhere and without smoke. Cook your favorite food everywhere you want in complete autonomy. Clean and smokeless flame combined with High efficiency and very low emissions are Enki Stove proposes. Enki Stove Wild is easy to use: you need just a few branches or other dry biomass, a small battery or a solar panel and a fire starter. A high end 10.000mAh battery is included with any stove kit (even those including solar panel or other accessories). It’s powerful enough to power a stove for 50 hours, or to power tow stoves for the half of the time. All connectors are USB compliant, which let you charge your phone while cooking. The battery runs a fan which regulates airflow into the combustion chamber. Basically the fan draws the gas produced by biomass, and transports it to the top where gas comes out from the holes. Once there, gas mix up with air and powers flame and process. When the flame covers up all the chamber top, connect the battery or the solar panel. That's it! Now its ready to use! The only waste left after Wild use is an organic charcoal called BioChar, in which are trapped CO and CO2, mainly responsible for the greenhouse effect. 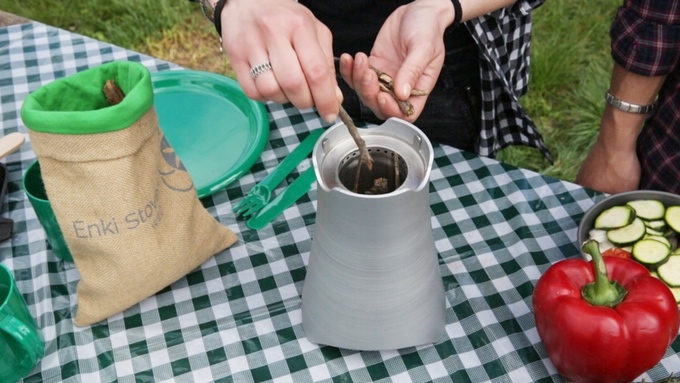 Biochar improves our health and the ecosystem’s one. Enki Stove devices are built with aluminium 1000 series and stainless steel AINSI 316; these materials are also used on nautical manufacture. Enki Stove Wild is part of the Clean Cookstove Catalog, a public-private partnership hosted by the UN Foundation to save lives, improve livelihoods, empower women, and protect the environment by creating a thriving global market for clean and efficient household cooking solutions. This campaign is live at Kickstarter and they have already achieved a whopping €30,500 against a goal of €30,000! 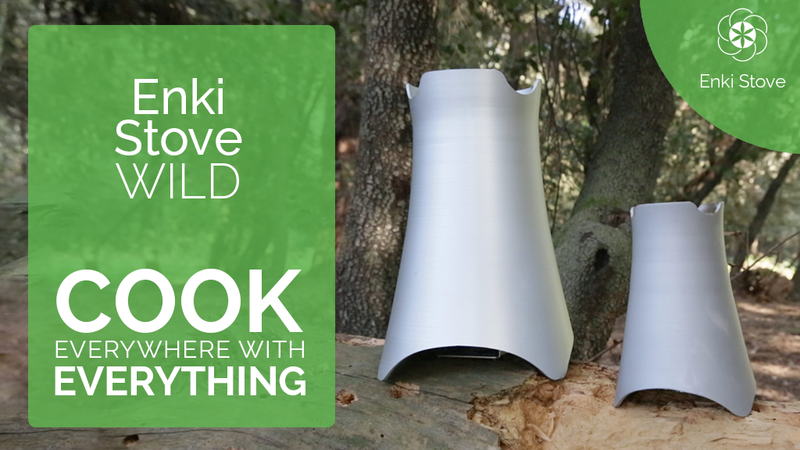 You can support and explore further for 'Enki Stove Wild' by clicking at the link Kickstarter.